9/3/2004 1:49:51 PM Mountain jfg:: Bye everyone, thanks for letting me sit in today. 9/3/2004 1:20:17 PM Mountain net:: getting a big buy signal on 10 min smh, semiconductor etf. maybe short covering after a hard down day or a ready for a rally on tue ? 9/3/2004 1:08:28 PM Mountain mjs:: IS Tide 32 pushing up a bit now? so down should contine shortly? 9/3/2004 1:04:57 PM Mountain mjs:: time for another stair step down OR? take the profits and run? 9/3/2004 1:02:57 PM Mountain mjs:: Since it is below the -Tide line does that work as resistance or is it just an energy line? 9/3/2004 12:59:23 PM Mountain mjs:: Do you think Fiegerbaum is explained on the web somewhere? I am not familiar with that ratio. Still looks like the trade is working well. As long as it stays below P now. 9/3/2004 12:53:42 PM Mountain mjs:: If we get to 3:00 and are sideways then it will break the -Tide so would it be good to close out there or better to let the profits run? Or move down a really tight stop? 9/3/2004 12:49:47 PM Mountain mjs:: I don't see anything to hold it here but still a few minutes more to bounce around like it did earlier. But then the Tide was moving together now they go apart. Look like more down. 9/3/2004 12:45:53 PM Mountain mjs:: Good it looks like it broke "P" this could be it. Is this a "streak" ? 9/3/2004 12:42:48 PM Mountain mjs:: looking like a stair step down the -tide. 9/3/2004 12:37:43 PM Mountain mjs:: Looks like a good trade to me. 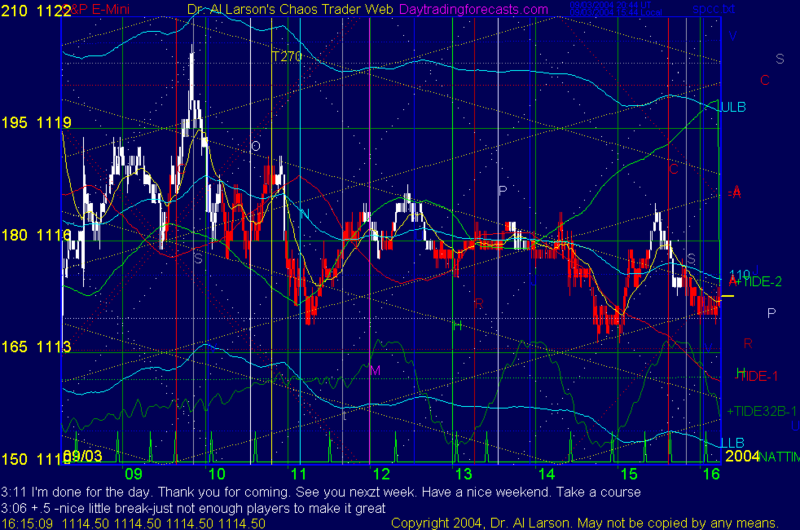 Market seems to have little conviction and with long weekend who wants to go long. Still was late compaed to first part of day. Cover on Close? 9/3/2004 11:58:09 AM Mountain net:: i think the bond mrkt closed early at noon c.s.t. tends to put the stock mrkt to sleep. 9/3/2004 11:51:29 AM Mountain jfg:: Yesterday market began to accelerate to the upside around the time of Jupiter conjunction with NY. That would be at this time today. 9/3/2004 11:45:23 AM Mountain jfg:: I believe there is some price and time squaring going on around now, 13:46 to 13:56 time frame . Possible, but not guaranteed, market movement as a result. 9/3/2004 9:54:14 AM Mountain mjs:: "P" could be the support if so and we break it at 3:00 that could be a major precursor for market ahead. This is also about where the QQQs are bouncing now that is at "P"
9/3/2004 9:51:51 AM Mountain g9:: Dr AL.....looking at the Moontide Harmonic grid.....low is in? Whata think, pain for the shorts into a Friday close? 9/3/2004 9:51:05 AM Mountain jfg:: will do, thanks. 9/3/2004 9:42:49 AM Mountain jfg:: Forgive my ignorance as a newbie, but are the "tides" the red and green wigglly lines, one an inversion of the other ? They look like "Natal" lines. Are they, and if so is there anything special about them (i.e. proprietary massaging or anything) ? 9/3/2004 9:40:11 AM Mountain mjs:: Looking at tides it seems this market will not take direction till 2:00 or later till then just a range and snaking. Any thing out there to effect this market befoe then? 9/3/2004 9:29:15 AM Mountain mjs:: looks to me like the turn are preceeding the tides so this is not a stall but the beginning or the rebound. Anything else to push market up? 9/3/2004 9:21:32 AM Mountain jfg:: thanks I see it now, the Red "R"
9/3/2004 9:21:21 AM Mountain mjs:: I was looking at the tide crossovers as turns. So now we go down to Mars or rather that far out in time and expect a turn? 9/3/2004 9:09:03 AM Mountain jfg:: Is there a Mars horizontal on Al's char ? What price level are you refering to, to see if my chart is similar. My next mars line is at about 1110.00 fwiw Is that the same as your's ? 9/3/2004 9:04:53 AM Mountain net:: down to mars ? 9/3/2004 9:03:20 AM Mountain jfg:: Do you think the current drop is an an echo (or repeat) so to speak of yesterday's Vertex action mentioned ? 9/3/2004 9:00:26 AM Mountain mjs:: Being new to this system it doesn't appear the market is being effected yet by the tides? Am I seeing this correct? 9/3/2004 8:48:19 AM Mountain mjs:: I checked Briefing.com and they day cyclicals up tech down giving no real direction but slighlty negative. Is it useful to look at such comment trading your charts? 9/3/2004 8:45:24 AM Mountain jfg:: Yesterday morning's uptrend turned to retracement at 11:01 Ephemeris said that at 11:00 Vertex 12O Neptune, 11:05 Vertex 90 Mars and Vertex 144 Chiron. Today's Eph says these should take place at 10:55 and 11:03 , fwiw, if anything. Do you follow Vertex at all ? I'm trying to learn about it. 9/3/2004 8:39:57 AM Mountain jfg:: I believe some price-time squaring is going on at this point (10:38 to 10:412 time frame NY time, so possibly some pause, revesal or acceleration. 9/3/2004 8:25:45 AM Mountain jfg:: I'm curious about your chart, with a quick glance at my ephemeris, it seems that your "time" lines are possibly the times when NY is conjunct with the particular planetary body, is that correct, or is there something else to it (your vertical colored lines)? 9/3/2004 7:37:16 AM Mountain jfg:: This is my first time to the clinic. Is it open now, and will there be comments and discussion forthcoming ? Thanks !